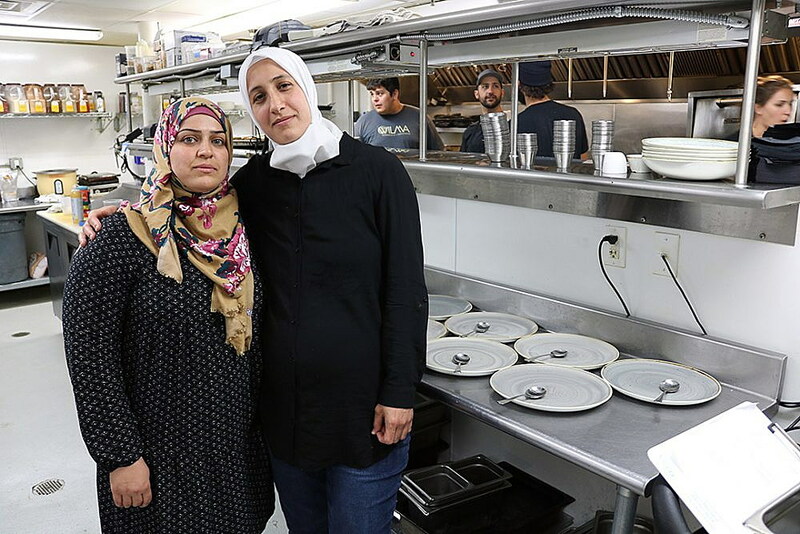 It’s Sunday evening in Missoula when Sahar Alzaidi and her friends from Iraq and Syria take to the kitchen at the Top Hat to prepare a Middle Eastern meal for several hundred ticketed guests bantering over drinks in the dining room. Alzaidi arrived in Missoula with her husband, Mohammed Alyoudawee, and their two young children 18 months ago as refugees. While the transition to a new culture and climate was at first unsettling, the family was warmly received and has since settled in. Alzaidi, who didn’t speak English when she first arrived, now has a basic grasp of conversational English – a skill she learned through classes and her job in child day care. Her husband, who served alongside U.S. forces in Iraq and now works as an engine technician in Missoula, fills in the gaps. Primarily, what is it about food that brings people and cultures together? Sunday’s event, “A Taste of the Middle East,” kicked off a lineup of events hosted by Soft Landing Missoula as park of International Welcome Week. While Missoula is the only city in Montana with a refugee resettlement program, it’s not alone in its work to integrate refugees into American culture. 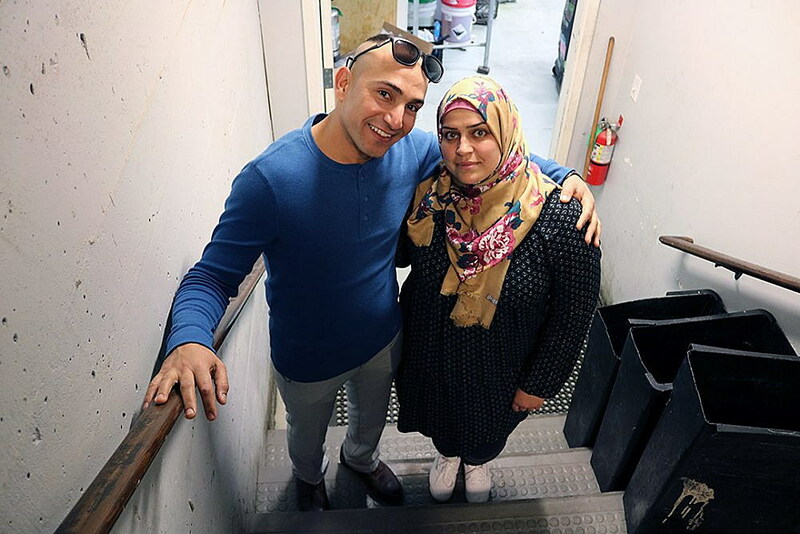 Thousands of other organizations in cities nationwide are doing the same, though in Missoula, it all starts with a three-course dinner prepared by four refugee families from Iraq and Syria. While the food may be unfamiliar, its universal appeal helps erase borders and sparks easy conversation. Poole helped spearhead the efforts that culminated in 2016 with the International Rescue Committee reopening a resettlement office in Missoula. Since then, Missoula has welcomed roughly 236 refugees from four different countries, including Iraq and Syria, Congo and Eritrea. Those who have made the journey bring stories unique to their past, and each was deeply vetted by the U.S. State Department. While opening an office in Missoula was at once controversial, the families who call Missoula home have blended with the larger community, their culture and customs warmly embraced. The program found its start in Missoula as President Donald Trump settled into office. Since then, the administration has systematically dismantled the nation’s refugee resettlement programs, and done so at a time when the world’s refugee population is climbing. Over the past five years, Poole said, the U.S. quota ranged from 70,000 to 110,000 refugees. Trump slashed that number last year to 45,000, according to the New York Times. Secretary of State Mike Pompeo on Monday announced a new ceiling for refugees at 30,000 this fiscal year. The global refugee population stands at roughly 25 million. While the politics surrounding refugee resettlement play out in Washington, D.C., those who transitioned their life to Missoula have embraced new opportunities. Alyoudawee moved his own family across the globe to provide a better opportunity for his two sons, who are now 6 and 2 years old. Since arriving in Missoula over the past year, the city’s refugee families have shared their culture and customs in unique ways. They’ve hosted soccer tournaments – a global sport – and presented plays, such as “When One Becomes Many,” in which families from the Democratic Republic of Congo tell their story. They’ve worked to learn English, find work and share meals with new friends. That food, Poole said, has the power to unite. Ghalia Almasra arrived from Syria nearly two years ago. She too is learning English and was pleased to converse with Sunday night’s dinner guests. She was also eager to cook and share, just as she did before her life was uprooted at home. Looking for more coverage of Missoula’s refugee efforts?